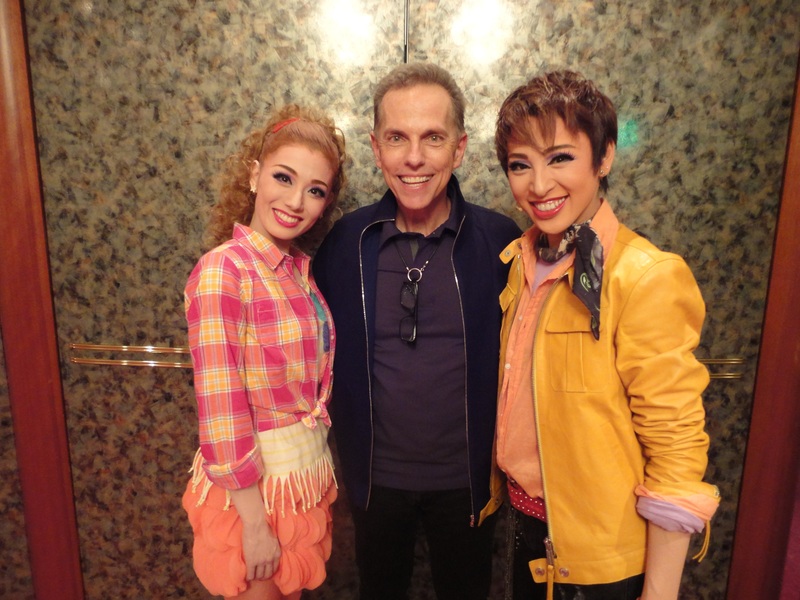 On Friday, July 6, I had the privilege of attending the final dress rehearsal for the highly-anticipated Takarazuka Theatre production of FOOTLOOSE at the awesome Umeda Arts Theatre, an 1,800-seat state of the art complex in the middle of Osaka. I was greeted warmly by members of the the production company, the theatre staff and employees of Takarazuka before the lights went down and the cast of 40 (FORTY!) launched into their astonishing version of our show. Because women are playing all the characters, I anticipated that I would always be aware of their female-ness in the male parts. But two minutes into the show, I totally accepted the performers in the 'pants' roles and had to remind myself... from time to time... that, 'That's a woman doing that up there!" In the same way the all-male Elizabethan acting troupes of the 16th century and the Japanese Kabuki troupes of the 17th century (right up to the 21st century!) convinced their audiences that men could play women, the ladies of Takarazuka make us believe that they are men. After all, it's what they're trained for. Very shortly after auditioning - in their late teens - and being accepted by the school in the town of Takarazuka, young girls are assigned the gender of the roles that they'll always be playing in the company's productions. Those performing male roles then have to train their voices to build up the lower part of the range; they learn to sit and walk and gesture and talk like boys or men. They maintain a rigorous physical regimen because they'll be expected to execute the lifts and strength-demanding moves in dance numbers. The young actresses accepted into Takarazuka wear uniforms to class and live in dormitories for the next two years as they are groomed to join the company. Except for a few weeks off three times a year (to visit family, etc.) they remain devoted to their theatre studies, and when the time comes, each girl is assigned to one of the five acting troupe that Takarazuka keeps moving around Japan. 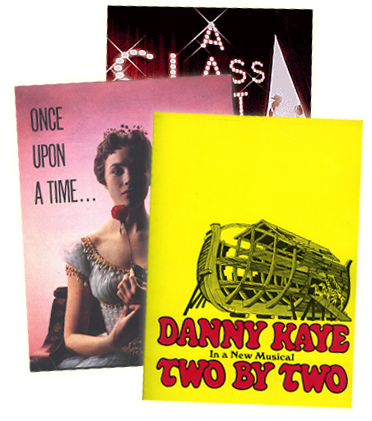 For instance, the ensemble doing FOOTLOOSE, the Snow Troupe - which is famous for its musical performances - consists of 65 players; while forty of them are onstage here in Osaka, the other twenty-five are doing a revue back in Takarazuka. And these ladies have the training and stamina of athletes. Broadway performers are justifiably famous for maintaining their rigorous eight-performance-a-week schedule; the casts of Takarazuka do TEN performances a week. And once the Snow Troupe winds up its Osaka run of FOOTLOOSE at the end of July, the entire production will immediately transfer to the city of Fukuoka, where they'll do another month of that back-breaking schedule. An unexpected treasure of this production is the actress Aki Misuza, who brings true dignity and heartbreak to the role of Reverend Shaw. At a press conference afterward, I was able to tell the dozens of reporters there -- through an interpreter, of course -- of the thrill I felt at having our work presented with such energy and artistry by Takarazuka. The accompanying photo was snapped at that media event; I'm flanked here by Mimi Maihane (Ariel) on the left and Kei Otozuki (Ren) on the right. 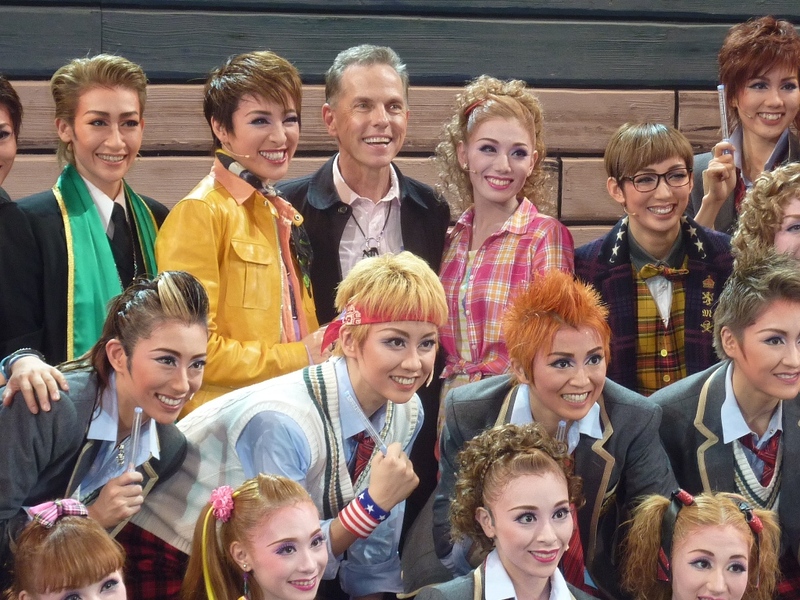 In the final part of my Japan blog, I'll write about the opening night performance of the show before a full house of cheering fans.